Dr. Robert Stanley’s professional career began as a Mechanical & Aerospace engineer. After receiving his BS, MS and PhD from North Carolina State University in engineering with a concentration in control theory, he enjoyed almost a decade with a telecommunications company in Research Triangle Park. To pursue his passion of dentistry, he returned to school and earned his dental degree from the University of North Carolina at Chapel Hill School of Dentistry, where he became Smile Engineer™. As a dentist and an engineer, Dr. Robert Stanley has the unique ability to master and share his understanding of biomechanics as it applies to the daily implementation of dental implants. Dr. Stanley has extensive experience in implant surgery, as well as advanced bone and soft tissue grafting. 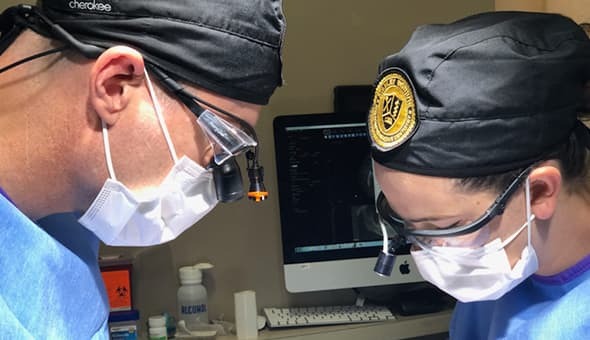 His implementation of 3D CBCT technology with guided dental implant surgery and guided sinus lift surgery makes planning and placing dental implants predictable and successful. He is a Diplomate with the American Board of Oral Implantology, the International College of Oral Implantologists (ICOI), certified in Oral, IV and Conscious Sedation and is a member of the Academy of General Dentistry, the American Academy of Cosmetic Dentistry (AACD), the American Dental Association (ADA), the Raleigh-Wake Dental Society, the North Carolina Dental Society, the Dental Organization for Conscious Sedation (DOCS) and the International Association of Comprehensive Aesthetics. Due to his uncommon depth of knowledge, Dr. Stanley— Smile Engineer™ is frequently called upon to consult with dental industry manufacturers, suppliers, and laboratories on product and process creation and improvement. Dr. Robert Stanley is a lifelong learner and enjoys sharing his passion for engineering and dentistry as the co-founder and continuing education (CE) instructor at The Stanley Institute. Additionally, he is an Adjunct Professor in the Department of Prosthodontics at his dental alma mater, the University of North Carolina at Chapel Hill School of Dentistry. When he is not in the clinic or the classroom, Dr. Robert Stanley is an avid athlete and enjoys CROSSFIT training, weightlifting, swimming, biking and running. In October 2017 he completed his first Ironman Triathlon in Louisville Kentucky. When time allows, he is an accomplished carpenter and uses his carpentry skills to build fine furniture. He and his wife and business partner are parents of four children.